Animals and Great War are connected in many different ways. We usually focus our attention on the trenches or on the battlefield, where animals and human beings competed or supported each other in a common struggle for existence. Yet also behind the front line their relation was nuanced. We find out also a special care for animals during WWI, as the Army Veterinary Service testifies. Almost all belligerent countries had similar special corps with the task to treat the sick or wounded animals, especially mules, pigeons and, of course, horses, which represented an irreplaceable mean of transport. Conditions were severe for horses: they were often killed by artillery fire or injured by poison gas, and suffered from skin diseases. Hundreds of thousands died. Those who survived were treated instead at veterinary hospitals and eventually sent back later again to the front. A first task of the veterinary corps was to diagnose diseases and to remove the infected animals in case of epidemics in order to prevent a mass killing in the already precarious sanitarian situation at the front (many horse diseases were in fact transferable to man). The British veterinary hospitals alone treated in one year more than 120.000 horses and we can suppose that similarly was undertaken also at the opposite front. It was however the treatment of wounded horses that characterized the veterinary hospitals of all Armies. Special clinics were built uniquely for surgery of horses and mules, where wounded animals were strapped to an elevating operating table and then operated. Sometimes however the surgeons were forced to work in precarious conditions. 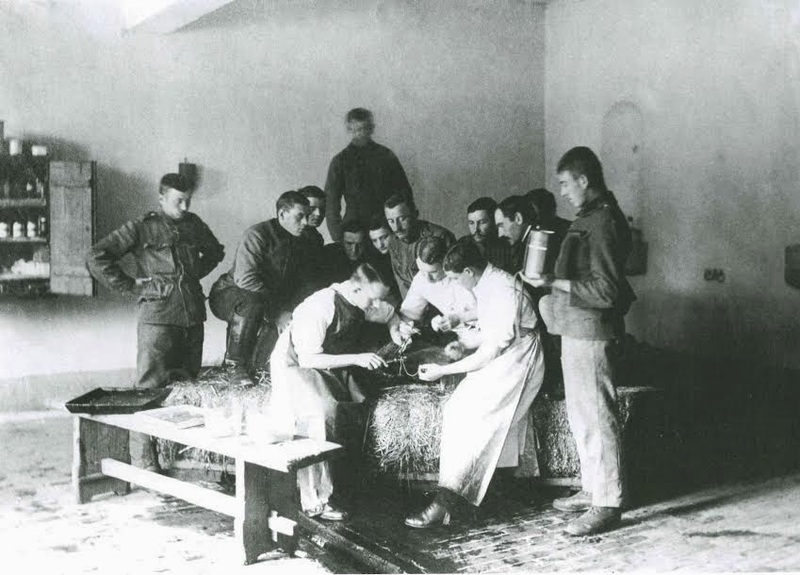 In this picture from the Kriegsarchiv in Vienna we can see for example the operation at a fistula at the withers in the veterinary Hospital for Horses in Praga Panenska. We thanks Eugenio Bucciol, the author of the book Animali al fronte and the editor of the same for the permission to publish this picture.